Foreign nations judge of France by its spectacles, romances, and pretty verses; by opera girls who have very sweet manners, by opera dancers who possess grace; by Mademoiselle Clairon, who declaims delightfully. They know not that, under all, there is not a more cruel nation than the French. Torture survived so long in Ancien régime France, through institutional inertia certainly, but also because it formed an integral part of the criminal law as laid down by the great Ordinance of 1670. Torture was not a penalty but part of the system of proofs. Judges resorted to torture in two, quite distinct, contexts: in the course of a trial in order to force a confession [question préparatoire] and after judgment to compel the condemned criminal to reveal his accomplices [question préalable or définitive] Both could be categorised as "ordinary" or "extraordinary" according to their severity. The question préparatoire found its logic in the hierarchy of "preuves légales." In order to pronounce guilt in a capital case, the evidence had to be certain, according to the addage, "as clear as daylight". This meant something quite precise and technical. "Full proof" required either a confession - but a confession supported by evidence - or the deposition of two eye-winesses. A single witness was only a "half-proof". The problem arose when the evidence against the accused was strong but not absolutely decisive. At this point a confession exacted by torture could seal a conviction. According to the rubric, in order to resort to torture, a judge must have presumptions which were "violent" or "vehement"; a single witness, material evidence or strong moral indication. When the culpability of the accused was probable, torture offered the possibility of turning quasi-certitude into total certitude. Only the Parlements or tribunals with more than seven judges could authorise the use of torture, which was reserved for capital cases - homicide, violent robbery, witchcraft or treason. In theory, all adults were liable, but in practice the weak, elderly, pregnant women and children were normally excluded. The procedure took place in the presence of a magistrat instructeur and representatives of the judiciary. By the 18th century a doctor or surgeon would always be in attendance to ensure that the life of the suspect was not endangered. Strict secrecy was adhered to - the accused had to be alone and had no right to have a lawyer present. As legal commentators insisted, the 1670 Ordonnance also set well-defined limitations to the scope of proofs extorted under physical duress. To be valid, a confession made under torture, had to repeated without coercion, and an accused could not be subjected to repeated torture unless further charges were brought against him. Historically, these limits had not always been adhered to. In the 16th century the Parlement of Paris ruled that in grave crimes or where the presumptions were strong, a confession made under torture could not be taken back. In cases of witchcraft until 1682 the question could be repeated without any new evidence against the accused. Even so, the total number of confessions was small. However, as the legal historian John Langbein has shown, the 1670 Ordinance also admitted the possibility of torture "avec réserve des preuves" or "les preuves subsistants". This permitted magistrates to order a non-capital sentence in cases where torture did not prove conclusive. As a result it became common for judges in the 18th century to omit torture altogether and opt for lesser penalties, especially as imprisonment now became a more realistic option. Criminal law evolved towards greater emphasis on evidence, and punishments reflected more closely the nature and certainty of the crime. According to Langbein it was this "revolution in the law of proof" which provided the momentum for the abolition of torture in France; in his view, the credit given to Enlightenment campaigners like Voltaire and Beccaria is merely a "fairy tale". This seems overstated. It is true that the institutions of the Ancien régime were often more adaptable in reality than they seemed in theory; but magistrates themselves were influenced by the wider current of ideas, and the changing sensibilities of the time. John H. Langbein, Torture and the law of proof; Europe and England in the Ancien Regime (University of Chicago Press, 2012, originally published 1977) Extracts on GoogleBooks. The Catholic Inquisition indulges in a spot of torture. Jean de La Bruyère, Caracteres (Paris, 1688) De quelques usages 51 iv. 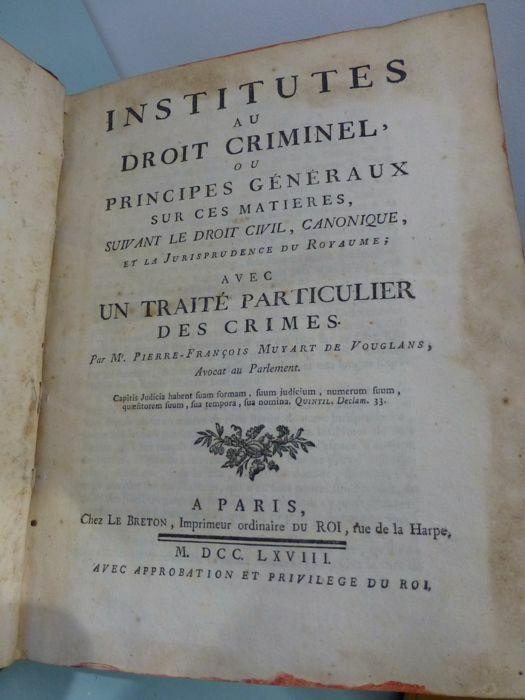 The commentary on criminal law by Daniel Jousse, published in 1771, includes a footnote with a whole list of opponents of torture drawn exclusively from the humanists and jurists of previous centuries. Well-known critics included Montaigne, Charron, Grotius, the abbé Fleury, Jean Domat, the advocates Jean Constantin and Pierre Ayrault. Augustin Nicolas, the late 17th-century magistrate and a disciple of Ayrault, was particularly regularly cited for his opposition to torture in witchcraft cases. By the mid-18th century, of course, the writers of the High Enlightenment were contributing loudly to the condemnations. Pain, wrote Beccaria, cannot be the test of truth, "as if truth resided in the muscles and fibres of a wretch in torture": "By this method, the robust will escape, and the feeble be condemned." To torture in secret strips the accused of his "public protection". 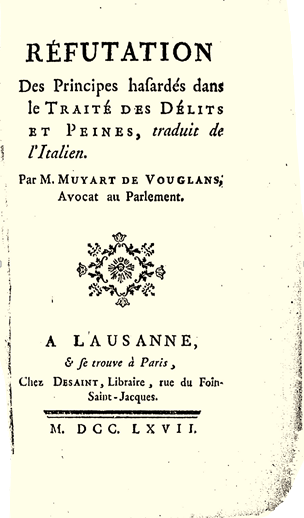 As Lynn Hunt points out, the abbé Morellet in the introduction to his French translation of 1766, did much to radicalise Beccaria's text by taking it an incidental reference to the abolition of judicial cruelty and erecting it into a plea for the "rights of mankind and of invincible truth". Lynn Hunt, "The 18th-century body and the origins of human rights." The Free Library 01 August 2004.
https://www.thefreelibrary.com/The 18th-century body and the origins of human rights.-a0117922505. _____, Inventing human rights: a history (2008), p.102-3. A selection of Enlightenment texts is given below. The jurisconsults often expressed doubts about the effectiveness of torture. It comes as a surprise to learn from Serpillon, that the magistrates responsible for the 1670 ordinance themselves thought the question préparatoire was useless and cruel, though justified by ancient usage (See passage below). 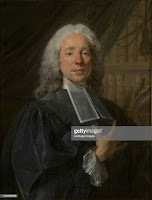 The Parisian lawyer La Combe, writing in 1741, remarked that even the question préalable seldom yielded results, since convicted criminals preferred to save their revelations for the foot of the scaffold. However, although they varied in their expressions of distaste, the great commentators - Muyart de Vouglas, Serpillon, Jousse - all defended torture as sanctioned by long legal practice. They held that the question préparatoire was warranted in serious cases; Muyart de Vouglas, who had few reservations, wrote of, "the necessity to torment the body of the accused to come to a full conviction". In his opinion a few innocent men tormented unjustly were of no significance compared to a million cases where the guilty had been convicted only by torture. The question prélable was always less problematic, since those tortured had already been sentenced to death; Beccaria's radical proposition that convicted criminals had the right to be preserved from pain found few echoes among the lawyers: as Serpillon put it, "there is no need to scruple about torturing a man one is about to execute" (Serpillon, p.924). There was a genuine fear in 18th-century legal circles that the suppression of torture would make it impossible to convict hardened criminals. Many Continental states, like Frederick the Great's Prussia, abolished torture piecemeal to test its impact on deterrence. 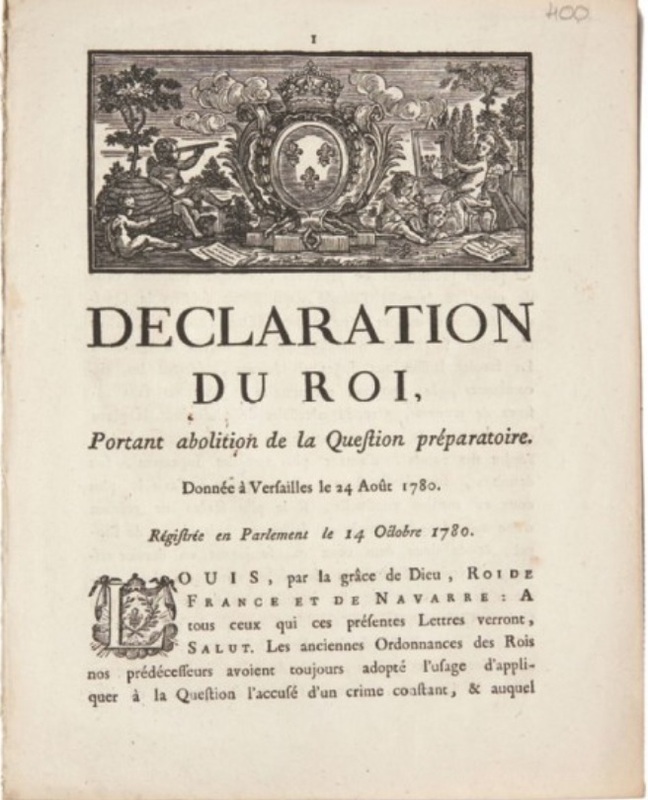 Similarly the edict which finally sought to abolish the question prélable in 1788, reserved the right to reestablish it. "if, after some years of experience, we gather from the reports of our judges that it is an indispensable necessity". Torture was finally abolished by Louis XVI's enlightened ministers in the 1780s. 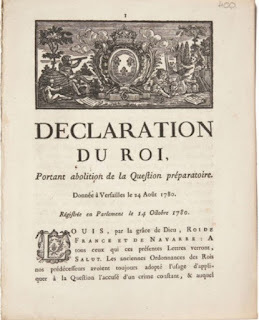 The question préparatoire was suppressed first, in an edict of 24th August 1780, one of a number of liberal reforms at this time which included the abolition of serfdom and of mortmain on royal estates. There was little overt dissent. The final abolition formed part of Lamoignon's legal reforms, which were blocked at the start of the Revolution. Final credit for the suppression of torture goes therefore to the decree of the Constituent Assembly of 8th October 1789. Wenzel, Eric. "La Question... en question. La torture judiciaire comme enjeu "médiatique" à la veille de la Révolution", Le Temps des médias, vol. 15, no. 2, 2010, pp. 169-179. We have before us the example of a nation, blessed with an excellent civil government, where, without any inconvenience, the practice of racking criminals is rejected. It is not, therefore, in its own nature, necessary. So many men of learning and genius have written against the custom of torturing criminals, that after them I durst not presume to meddle with the subject. I was going to say, that it might suit despotic states, where whatever inspires fear is the properest spring of government; I was going to say, that the slaves among the Greeks and Romans — But nature cries out aloud, and asserts her rights. Beccaria, On Crimes and Punishments, Chpt.16: "Of torture". No man can be judged a criminal until he be found guilty; nor can society take from him the public protection, until it have been proved that he has violated the conditions on which it was granted. What right, then, but that of power, can authorise the punishment of a citizen, so long as there remains any doubt of his guilt? …..
….,it is confounding all relations, to expect that a man should be both the accuser and accused; and that pain should be the test of truth, as if truth resided in the muscles and fibres of a wretch in torture. Every act of the will is invariably in proportion to the force of the impression on our senses. The impression of pain, then, may increase to such a degree, that, occupying the mind entirely, it will compel the sufferer to use the shortest method of freeing himself from torment. His answer, therefore, will be an effect as necessary as that of fire or boiling water; and he will accuse himself of crimes of which he is innocent. So that the very means employed to distinguish the innocent from the guilty, will most effectually destroy all difference between them. It would be superfluous to confirm these reflections by examples of innocent persons, who from the agony of torture have confessed themselves guilty: innumerable instances may be found in all nations, and in every age. How amazing, that mankind have always neglected to draw the natural conclusion! Lives there a man who, if he have carried his thoughts ever so little beyond the necessities of life, when he reflects on such cruelty, is not tempted to fly from society, and return to his natural state of independence? These truths were known to the Roman legislators, amongst whom, as I have already observed, slaves, only, who were not considered as citizens, were tortured. They are known to the English, a nation in which the progress of science, superiority in commerce, riches and power, its natural consequences, together with the numerous examples of virtue and courage, leave no doubt of the excellence of its laws. They have been acknowledged in Sweden, where torture has been abolished. They are known to one of the wisest monarchs in Europe, who, having seated philosophy on the throne, by his beneficent legislation, has made his subjects free, though dependent on the laws; the only freedom that reasonable men can desire in the present state of things. In short, torture has not been thought necessary in the laws of armies, composed chiefly of the dregs of mankind, where its use should seem most necessary. Strange phenomenon! that a set of men, hardened by slaughter, and familiar with blood, should teach humanity to the sons of peace. A very strange but necessary consequence of the use of torture, is that the case of the innocent is worse than that of the guilty. With regard to the first, either he confesses the crime, which he has not committed, and is condemned; or he is acquitted, and has suffered a punishment he did not deserve. On the contrary, the person who is really guilty has the most favourable side of the question; for if he supports the torture with firmness and resolution, he is acquitted, and has gained, having exchanged a greater punishment for a less. The Encyclopédie: "Question - Criminal law"
The article by Jaucourt immediately follows "Question or Torture - Jurisprudence", an anodyne presentation of the legal protocols. I could point out that the Athenians only used the question in cases of lese-majesty, and that they had no knowledge of the preparatory question; that for the Romans, birth, dignity and the military profession exempted individuals from torture and that only slaves over whom their owners had the power of life and death were exposed to it; similarly, at the time of Charlemagne, the question was only given to slaves. But these remarks are weak, since the law of nature cries out against the practice without allowing any exception for anyone whatsoever. Independently of the voice of humanity, the question does not meet the aim attributed to it. On the contrary, it is a sure way to condemn an innocent person with a weak and delicate constitution and to save a guilty individual who was born robust. An individual who can bear torture and one who lacks the strength to stand it, both lie. The torments that people suffer under torture are certain and the crime of people undergoing it is not. The unfortunate man being tortured is less interested in saying what he knows than in freeing himself from what he feels. So, as Montaigne said, torture is a dangerous invention. It is, he goes on, “a test of patience more than truth, since why should pain make an unfortunate person say what is true rather than make him say what is not true? And if, on the other hand, a person accused of what he has not done is patient enough to bear such torments, then why shouldn’t one who has committed the crime do the same, since such a fine reward as life is assured him? In short, it is a means full of uncertainty and danger. What won’t we say, what won’t we do to escape such grievous pain? From this it follows that whoever a judge has tortured so as not to let him die innocent, only lets him die innocent and tortured. I would have no more difficulty in putting forward other reasons against torture that have not yet been proposed. It is at least certain that if one cannot take a man’s life on doubtful proof, then the proofs torn from him by torture will be just as doubtful. So an extorted confession cannot serve as a motive for a death sentence. If we maintain we must not sentence anyone to death after the voluntary confession of a single person, then neither can we order an execution after a confession forced out of someone by torture. The grave magistrate, who for money has bought the right of making these experiments on his neighbor, relates to his wife, at dinner, that which has passed in the morning. The first time, madam shudders at it; the second, she takes some pleasure in it, because, after all, women are curious; and afterwards, the first thing she says when he enters is: “My dear, have you tortured anybody to-day?” The French, who are considered, I know not why, a very humane people, are astonished that the English, who have had the inhumanity to take all Canada from us, have renounced the pleasure of putting the question. Joseph-Michel-Antoine Servan, celebrates the abolition of the question préparatoire in 1780. The question prévisoire is a very delicate thing, since it attempts to draw the truth from the mouth of an accused man by force of torment... even if he is acquitted in the final Judgment, he is often crippled for life. If someone is accused of a capital crime, and does not admit anything, he can only be condemned to lesser penalties. Declarations made by someone under torture do not always inspire entire faith. But as for the question préalable, for the revelation of accomplices by the condemned to death, there is no inconvenience, and often a great benefit for civil society; there is no need to take great care with a person who is condemned to death and about to be executed. (p.534-5). This earlier commentary by Muyart de Vouglans pre-dates the appearance of Beccaria's work. Twenty years later in, Les Lois criminelle en France dans leur ordre naturel (1780) Muyart was to reiterate exactly the same positions; earning himself opprobrium as the last great defender of torture. In reality, his views are no more extreme than those of the other commentators - the difference lies mainly in the forthrightness of his expression. He certainly seems strangely unconcerned that innocent people might be killed or maimed by a judicial procedure. Proofs: Forced confessions, confessions made under torture: It cannot be denied that there are reasons to reject the use of Torture, but there are stronger ones to justify its use in certain circumstances. The reasons which exclude it derive from the fact that Torture, which torments and mutilates the body, is a true penalty; there is a sort of injustice and inhumanity in punishing a man before he is convicted of a crime. Torture can also often be useless, in that if the accused is strong, he will suffer it without confession, whereas the weak person will admit a crime he has not committed; or he might even expire under the weight of torture, if it is prolonged, as happened in the sad case of Le Brun. At the same time that our Ordinances authorised torture, they attached particular Conditions. These attest to great circumspection with which Judges must employ a method which is equally dangerous for the soul and for the body of the person who has the misfortune to undergo it. Muyart emphasises that torture must be employed in carefully controlled conditions, since it is a method which is "equally dangerous for the soul as for the body". He outline the detailed requirements of the 1670 Ordinance: the presence of a doctor, the need to take account of the health of the subject; the obligation for confessions to be repeated in freedom from duress. Penalties: QUESTION avec réserve de Preuves en son entier....according to the Ordinance this Question should not be ordered unless there are considerable proofs against the Accused; when only his Confession is lacking to condemn him to the death penalty. The proofs against him should be sufficient to condemn him to any other sentence; the Question is either ordinary or extraordinary. The first is less severe than the second, which is usually double, that is to say if the torture is by Water or Brodequins, as in the jurisdiction of this Parlement, the number of pots of water or wedges is doubled. It may be judged from these Examples, and from the severity of the ordeal, that the Ordinance places death immediately afterwards. Indeed death is sometimes caused if the torture lasts a long time, or if the subject is of a weak disposition. There is a memorable example of this in the Causes célèbres in the person of Le Brun. For this reason torture should not be given to people who have descendants, and according to the authorities, it should not last more than an hour or an-hour-and-a-half at the most. Torture should not be given until eight or ten hours after a meal. It is to be noted that this ordeal is used, not to punish a guilty man but to acquire proofs against him. For that reason it does not entail Infamy, still less Confiscation of Property. If a man dies before the final Judgement he is said to have died integri status, with no requirement to rehabilitate his memory; however, his heritors have no right to damages even if his innocence is subsequently proven. 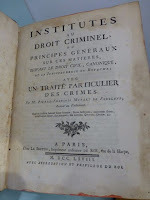 Institutes au droit criminel (1757), p.403-4. François Gayot de Pitaval, Causes célèbres et intéressantes vol. 3(1747), p.219f. If one is to believe this Author, the use of Torture must be abolished, as a practice which is both cruel, unjust, useless and dangerous. It is cruel, he maintains, to torment a man before he is convicted of a crime; unjust. ..to oblige him to be his own Accuser; useless, because, by the admission of the Jurisconsults, confession under torture is invalid unless confirmed by subsequent avowal. It is dangerous because experience has shown that innocent people of weak disposition have falsely confessed under torture, whilst a "crowd of robust scoundrels", have escaped punishment for their crimes. Everything the author writes on the subject can be dismissed with the observation that he only repeats what has already been said. Other Authors...have failed to prevent the survival of torture into modern times. These Authors wrote before the 1670 Ordinance which established rigorous precautions against the "inconveniences" which had aroused their indignation. We have described these precautions elsewhere and also observed that anyone put to torture today is more than half-convicted of the Crime. There is no longer danger of confounding Innocence and Guilt.... For every example of an Innocent tortured a century ago, we can oppose a million instances where criminals have been brought to justice. Without this recourse, the majority of atrocious crimes - Murder, Arson, Highway Robbery - would remain unpunished; infinite numbers of citizens would become innocent victims, not of torture, but of calculating villains. ("des scélérats les plus subtils"). In many cases, confessions under torture have led to the discovery of stolen goods or the bodies of murder victims - which proves that it neither useless, unjust nor cruel. The utility of torture can be drawn from experience. The Accused himself is made Judge in his own case, and can avoid the Capital penalty; it is sometimes impossible to resolve the case by any other means. Torture has been universally approved by all the nations. .. It is the favour [shown by Beccaria] towards the Accused which provided the motive for the new Law in which our august Monarch abolished the use of the question préparatoire. Whatever Tolerationists may say, this law...confirms our principles. Its goal is instruction rather than moderation of punishment ; it leaves intact the question préalable which concerns only those condemned of crimes. The Prince has made three additions which leave no avenue open to our self-appointed Reformers. Firstly he declares that he has made this suppression according to "the reflections and experience of the first magistrates". Secondly, he evokes his "natural clemency"; thirdly, he leaves full authority to the Law in other matters concerning "proof et the punishment of crimes". The public has, for a very long time, protested against the use of torture. There were even representations at the Conferences [ie. in 1670] on this point: M. Pussort, the principal editor of this Law, admitted that torture had always seemed to him useless: "if one puts aside prejudice based on ancient usage, one finds that torture rarely draws truth from the mouth of the accused". M. le premier Président [Lamoignon] agreed that there were good reasons to suppress it; it was his personal opinion that there was nothing more cruel or unjust than the question préparatoire. The Romans subjected their slaves to it, but only because they regarded them as domestic animals; they never tortured citizens; all the more reason for Christians and civilised people to abandon the practice. Quintilian said that the efficacy of torture depended on temperament; a rogue with a robust constitution would deny his crime, whilst an innocent of delicate disposition confessed to crimes he had not committed. If...pain makes an accused man testify against himself, can one draw the conclusion that he is really guilty? Is it not better to let a few guilty men go free, than to expose the innocent to peril? These considerations have convinced several European monarchs to abolish torture. In Prussia it was suppressed fifteen years ago; in England it is no longer in use... Several innocent people have died under torture, that is too common knowledge to need proving in detail. M. d'Alembert, in a letter to M.Rousseau, published in 1759, wrote in praise of the abolition of preparatory torture in Geneva. There follows a list of 17th century examples: including those of Langlade and Lebrun from the Causes Célèbres. Other examples are cited from the treatise of Augustin Nicolas.... Serpillon then goes on to describes some incidents at Autun which he himself has witnessed. Torture, he concludes, is "a punishment as severe as several sorts of death sentence", but still not technically "a penalty". Despite these observations, Serpillon subsequently confines himself to setting out the established legal procedures; in much the same way as Muyart de Vouglans, he enumerates the proofs needed for torture and the conditions under which it is applied. 2. It is no less inhuman to force an accused to speak the truth in spite of himself and admit his guilt under torture; this goes against the rule of natural law ("cette regle du droit naturel") which teaches us to do all that necessary to preserve and defend our lives. 3. Torture as a means of forcing the truth out of the accused's own mouth is often uncertain and useless. If the accused is robust, he will endure torture without confessing; but if he has a weak and sensitive disposition, torture will oblige him to admit a crime he hasn't committed (as La Bruyère pointed out). There are examples of this happening among both the Ancients and Moderns. In spite of all these objections, the use of torture has prevailed among the majority of nations, especially in Europe; this usage has been sanctioned for good reasons, not only of public interest but also of equity. An accused is never condemned to torture unless there are considerable proofs against him; in this case there is no injustice in imposing torture; whereas there would be a great injustice in acquitting him or leaving him unpunished despite the weight of proof. As to the question préalable, it is both useful and of great benefit to civil society. The arguments against the question préparatoire, do not apply when the accused is already condemned to death; he has no motive to conceil the truth and no concern for his life since he is about to be executed. Traité de la justice criminelle , vol. 2 (1771), p.474-476.